Great attendance and busy evening for Chris Dorley-Brown. Original show with lots of prints, memorabilia and slideshow in a dark tent. Go there asap it's great, and so is the book. 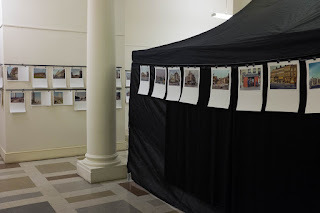 We are delighted to announce a new exhibition of previously unseen photographs by David Granick which depict Stepney, Mile End, Whitechapel, Spitalfields, Limehouse and the Thames riverside in the warm hues of Kodachrome film. In the decades following the end of the Second World War, the East End was a place usually captured in black and white, so these photographs present a rare chance to see views of these neighbourhoods in the 1960s and 1970s - some still familiar, many since vanished - in colour for the first time. David Granick was born in 1912 and lived his whole life in Stepney. 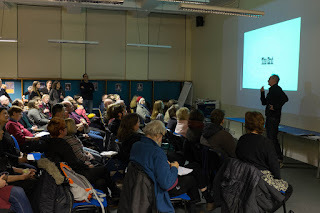 A Jew, a keen photographer and a long-serving member of the East London History Society, he gave lectures on various local history themes illustrated with colour slides taken by himself or his fellow members of the Stepney Camera Club. Bequeathed to Tower Hamlets Local History Library & Archives after his death in 1980, where they have been preserved ever since, these photographs show the East End on the cusp of social change. The exhibition coincides with a beautiful hardback book of photographs from the Granick collection, to be published by Hoxton Mini Press. Discounted copies will be on sale here during the run. Talk from Chris Dorley-Brown, curator, at 7pm.